It’s been a tough couple weeks on the baseball field for Michigan. Rounding out the west coast trip was a mixed bag, including a loss to Long Beach State who is now 3-18 but a win over now top-ranked UCLA. Michigan dropped close games against USC and Oklahoma State before heading back to Ann Arbor for the home opener, where they blew Manhattan and Western Michigan out of the water for 5 games. 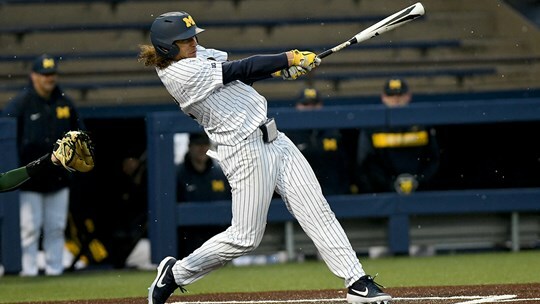 More recently, Michigan traveled to Lubbock for its own series with #19 Texas Tech…and looked less than competitive, losing all three games by a combined score 29-10, including dropping the final game after leading through four innings. Michigan entered the weekend as the #24/25 team in the polls but will likely duck out after that sweep despite putting up 16 on Stetson to end their road trip. Big Ten play is right around the corner as the sun continues to warm and the days are getting longer. After a two-game series with San Jose State, Michigan State comes to town to kick off a home and home followed by Toledo and Minnesota. Michigan is beginning to hit the rhythm of their schedule now, with a conference weekend series followed by a MAC or other Midwest team, which will hopefully bring some consistency to the offense. Michigan has gone 7-8 since the last update, which isn’t terrible considering there were multiple solid opponents, but a loss against Long Beach State when they are this bad is pretty disappointing. That said, there are still plenty of bright spots that can help fans like us justify the past couple weeks up to jet lag and travel issues and that conference play will be more stable. The Jordans, outfielder Brewer and DH Nwogu are still absolutely raking. Brewer went yard twice against Stetson, giving him 7 homers for the season, most on the team. He’s slashing .381/.417/.714 and only striking out 17% of his at-bats, which is just incredible production for starting every game. Nwogu has heated up a bit to be slashing .344/.420/.525 with 14 runs scored as well as 4 doubles and 2 triples. Jesse Franklin has also started to heat up, hitting two home runs against Texas Tech (in the baseball equivalent of garbage time but hey we’ll take it), giving him five for the season and a .486 slugging percentage. Senior Blake Nelson has also lit fire, now slashing .422/.533/.578 as well as walking 11 times and scoring 12 and is currently on a 7-game hitting streak. Lefty ace Tommy Henry is also continuing a dominant season, taking his first loss of the season against Texas Tech (he didn’t allow an earned run), but shutting down UCLA for a massive early win that could help their tournament chances down the road. Through 6 innings against the Bruins, he walked only two and struck out ten, only allowing 2 runs. He remains to be the rock and will play the role of stopper if Michigan is in need of a win. Karl Kauffmann has also continued to pitch well; he demonstrated why wins and losses for pitchers are stupid, allowing only 2 runs, 2 walks, and 5 hits over 7 innings against USC in a losing effort. Texas Tech got to him a bit, tagging him for three doubles and 5 earned runs in 5 innings, but he should be perfectly fine against conference opponents. Shoutout to Isaiah Page who allowed only two runs through four innings in his start against Stetson over the weekend. It wasn’t the best couple weeks, but it was also an absolute doozy of a schedule. Michigan was in every game out west, making me feel like the Texas Tech series was the exception and not the rule to this team’s true ceiling. The pitching got dinged a bit in Lubbock, but in a weird way (and this could be reaching at straws to justify it), I’m glad it happened then as opposed to early in the conference season. Some good bullpens can even out the pitch location issues no problem. For as good as Brewer, Nwogu, and Nelson have been, Ako Thomas and Franklin need to pick it up more. Thomas’s most redeeming quality last year was his ability to draw walks and wreak havoc on the basepaths, but he’s only walked four times so far this season and has been held hitless in 7 games, which is already half of his total from last year. The schedule eases up a bit at this point in the season, so we can hope and expect that the ones that made the team go last season will join the train this year. The potential of Team 153 remains one of the nation’s best (beating UCLA does that), but a few more of the pieces have to fall in to place. 15-7 through 22 games looks fine on paper, but it could be 17 or 18 wins. The next few weeks should be fun.